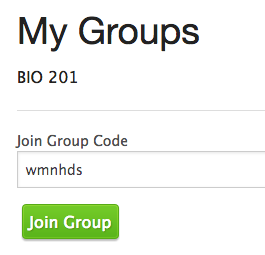 To join a group, the instructor will need to give you a Join URL or Join Code. You will need to create a student account first. Where JOINCODE is a a unique string of characters. Click (or copy/paste) link into your browser and you will be added to the group. If you are launching Visual Classrooms from your school’s LMS (Blackboard, Canvas, Sakai, etc), you should automatically be added to the correct group.